Ingmar Bergman’s career spanned over six decades. Crisis came out in 1946, being the first film he directed, and Saraband, the last feature Bergman directed, was released for television in 2003. He rose to fame and international recognition in 1957 with the release of his well-known picture The Seventh Seal. It portrays a man exploring existential matters while playing chess against Grim Reaper during the Black Plague. This film is allegorical, confronting the questions of mortality and faith. There is also a singular visual beauty to it, especially in the way it is shot. Ingmar Bergman was awarded the Prix du Jury at the Cannes Film Festival in 1957 for this film. Later this year, was also released Wild Strawberries. Over and above, he is the only director to have ever been awarded the Palme des Palmes at Cannes, which he received in 1997. As he exemplified the filmmaker as an artist, his fame helped pave the way for other arthouse directors like Michelangelo Antonioni. Seriousness is a word often used to qualify Ingmar Bergman’s work. Nevertheless, he directed numerous comedies, mostly inspired by the likes of Molière and Shakespeare. In the comical context, he employed the actors’ acting as a metaphor for life, revealing how people pretend and put on masks, playing fake personas, in their everyday life. Here we can cite Smiles of a Summer Night, which was released in 1955. This comedy stages the battle of the sexes, namely men against women, in romantic relationships. Ingmar Bergman focused on the matter of love once again in 1973 with Scenes from a marriage, where he showed love’s reality and existence under threat and danger. Pain, fear, and uncertainty were central themes of his work. To make his films, most of which he wrote, Ingmar Bergman often drew from his own experiences, questioning, and anxieties. As a director, he very much, if not always, worked with the same people, notably Sven Nykvist who was director of photography on several of Bergman’s pictures, including Persona. Despite collaborating with the same people, he managed to constantly change and renew the ways in which he expressed himself and his ideas. What made his work so powerful and relevant is the audacity and sincerity that it conveyed and still conveys today. The films he made always treated of some sort of crisis, how it comes upon us, how it affects us, and how we cope with the struggles that come with it. Ingmar Bergman also had a recurrent interest for the inner sensibilities and experiences of feminine characters. And this strong interest he had in women expanded itself in real life as well, him being a rather emotionally promiscuous character. Persona is an intensely complex picture. It is his most ambiguous and transparent film, as well as his most experimental and straightforward one. Perhaps also the most personal, as he pushed the limits further and further. 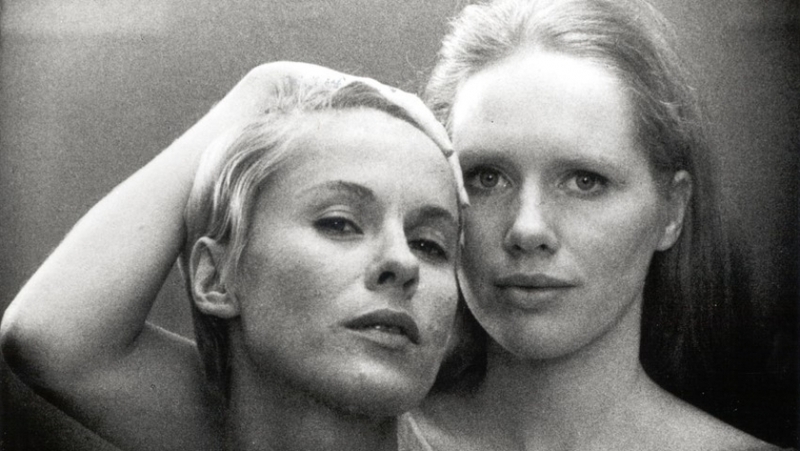 It tells the story of a nurse, played by Bibi Andersson, that has been put in charge of taking care of an actress gone mute, played by Liv Ullmann. They move together in an isolated cottage close to the beach. All along the film, the spaces and places in which the characters evolve seem to be vast and clean in their disposition. And this apparent simplicity is part of what makes this feature so complex. As we move forward in the story, we realise that the barriers separating reality, dream and fantasy start to erode, therefore it becoming increasingly hard for the spectator and characters to dissociate one from the others, just as the nurse and the actress undergo osmosis, colliding with each other. This feature deals with the relationship between performance and honesty, the difficulty of communication, and, once more, women’s inner feelings. The angst of particular scenes reminded me of Andreï Tarkovsky’s Stalker and its introspective penchant. Time Out described Persona as “Not an easy film, but definitely a rewarding one”, whilst Cahiers du Cinema wrote that “It was cinema refracting itself: the most beautiful film of Ingmar Bergman”.